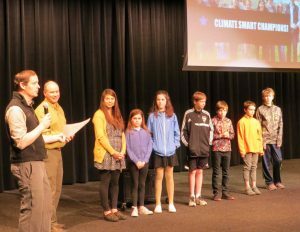 Climate Smart Glacier Country is pleased to announce the selection of the 2nd Annual Climate Smart Champions during a ceremony Saturday at the annual Earth Day Celebration in Whitefish. Awards were presented to businesses, youth and an individual who are leaders in building local solutions to climate change challenges. Ms. Cassie McCann’s 6th Grade Fall 2017 Science Class at Whitefish Middle School developed a partnership with local business to display student posters about local climate solutions. Students selected a local business they regularly visit and designed posters with a few tips for customers to make sustainable choices at the business. The customized posters also included a succinct scientific explanation about the greenhouse gas effect. Participating businesses include: Nelson’s Ace Hardware, Sage and Cedar, Loula’s, Village Shop, Buffalo Café, Stumptown Art Studio, Red Caboose, Toggery, Stumptown Snowboards, Jersey Boys, and Crystal Winters. Whitefish Lake Restaurant is a pioneer in local efforts to turn food waste into compost through a partnership with Dirt Rich LLC’s food scrap pick-up service. Owner Doug Reed says the restaurant has been pleasantly surprised at how easy it was to incorporate the waste diversion program into kitchen operations while saving money on weekly landfill fees. Big Mountain Commercial Association has made life easier for skiers and the Earth with its S.N.O.W Bus program. The Shuttle Network of Whitefish (S.N.O.W. )reduces traffic and parking congestion while saving roughly 10,000 gallons of gas, equivalent to 100,000 pounds of coal that won’t be burned. Sierra McCartney was appointed to the Whitefish Climate Action Plan Committee by Mayor John Muhlfeld and volunteered her evenings and weekends to design and produce the 129-page plan. In addition to hundreds of hours devoted to the CAP, Sierra is a landscape designer for White Cloud Landscaping, where she helped design the gardens and landscaping for Whitefish Schools’ Center for Sustainability and Entrepreneurship (CSE). 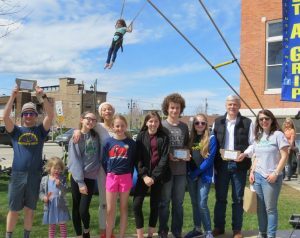 The Whitefish Climate Action Plan was approved by the Whitefish School District in March and by the City Council on April 16.